This is it. No, it isn’t bigger on the inside but it’s enough. For now. 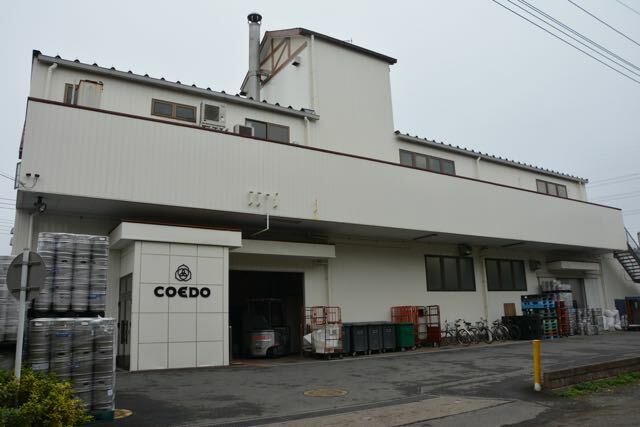 In November, BeerTengoku took a trip up to the Coedo Brewery in Tsuruse, Saitama. On the journey up from BeerTengoku’s base in central Kanagawa, we passed through suburbs, city centres, and finally through to farm land. While not as far away as expected, it’s becoming a common theme to see breweries far away from the major areas they serve. President of Coedo Brewery (or as he prefers to be called, “beer evangelist”), Asagiri-san met us as the station for the drive to the Brewery. Coedo Brewery is one of oldest and biggest names in Japanese craft beer and can often be found on supermarket shelves across Japan. Their range of five beers seems to have been around for time immemorial and, as is often the case with Japanese craft beer breweries, Coedo Brewery’s draft lineup is held in high regard. Coedo Brewery has worked with different breweries in the past to produce some American-Japanese collaborations and also expand their own range to include the Paradoxical IPA and Imperial Belgian, among others. When we arrived at Coedo Brewery, the first thing that came to mind was “hang on, this can’t be it. It’s too small.” It’s amazing that a company that has been around for almost twenty years still exists in this form. I was expecting different floors when we walked into the brewery; however, Asagiri-san explained that the brewery has more than met their production capacity up to now. 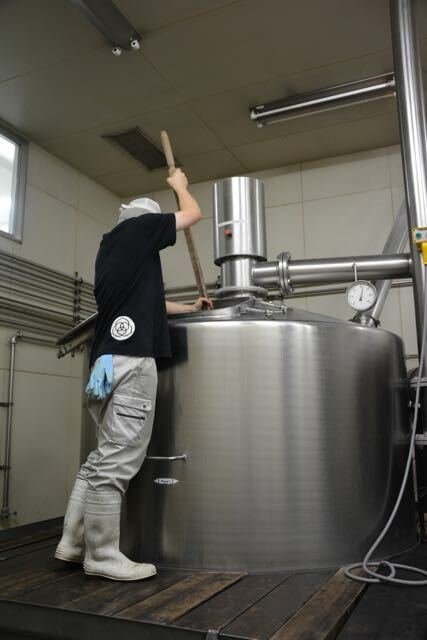 Coedo Brewery operates differently to other craft beer breweries in that they pride themselves on cleanliness and purity. Terribly unfortunate, Joe was unable to come on this trip up, but if he had then we would have shaky photographs of the Coedo sanitation process. Suited and booted in lab coats, hair nets, and wellington boots up to our knees, Asagiri-san and I went through a rigorous cleaning routine of walking in alcohol solution and washing our hands, then using alcohol spray before we even got in the brewery. The first stop was the production area with the mash and lauter tuns. 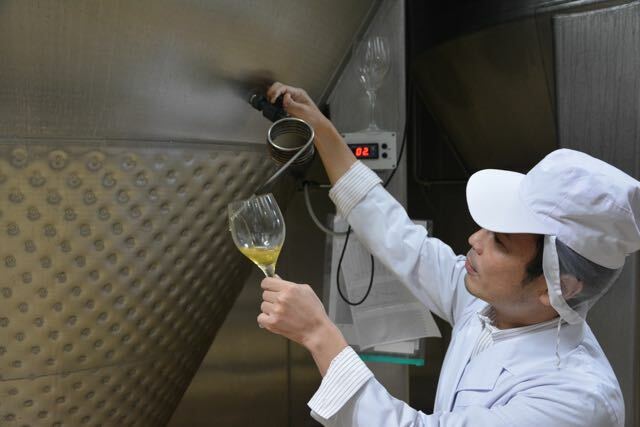 Coedo Brewery brews daily, often more when needed, and Asagiri-san was eager to explain about this room. It seemed hard to believe that there was no computer technology or automated processes involved. The mash was still stirred by hand and the tasting process is also done by the eight brewmasters at Coedo Brewery. Asagiri-san pulled off some of the wort from Coedo Beniaka beer that was being brewed and, safe to say, it didn’t taste anything like the beer on the shelf. The sweet potato hadn’t been added! The wort was wheaty and grassier than the bottled form and this is due to some of the bacteria involved in the process that is needed to break down the starch elements. Next was the milling room. 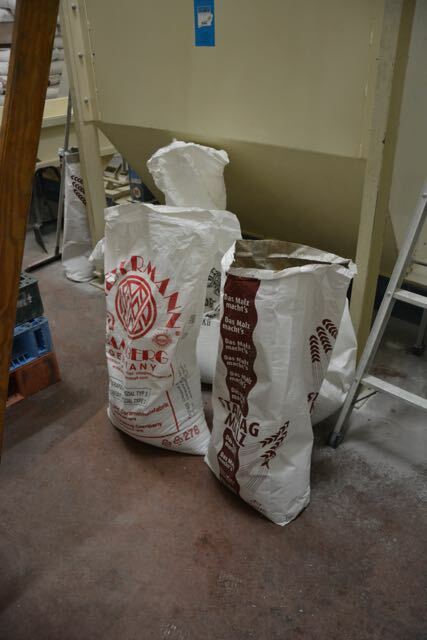 Situated next to the mash and lauter tun area, the milling room is where it all begins. Bags of malt were lying around and Asagiri-san was waxing lyrically about each type. The only problem was that it was bloody loud in the room thanks to all the machines going. The sour malt was the most surprising for me as, without giving the game away too much, it was sour. As in, bulldog sucking down on a pint of vinegar sour. Even though it is used to ensure the bacteria don’t have an effect on the beer, the sour taste would be interesting to try in a beer. Asagiri-san professed a love of sour beers, so who knows? The new Coedo Marihana session IPA. Review coming soon. With a belly full of wort and malts that made me feel like my own body was fermenting beer [at least this time you had an excuse for all the farts- Joe], it was on to the fermentation tanks and storage area of Coedo Brewery. A small door swung open and a big draft of cold air came out, sending a shiver up my spine. Even though there was no computer technology, how did Coedo Brewery manage to keep this room so cold? All 33 fermentation and storage tanks are 6kL and double layered, with the outer layer having a dimpled surface like a golf ball that allows cold water to be passed through, thus cooling down the tanks. We were also lucky enough to try the Coedo Session IPA from the tank and we were impressed. The Citra hops certainly came through with the fragrance of the cascade hops. The alcohol helped us to come to terms with how small the brewery was but before we knew it, we were standing in the bottling room watching empty cans go in and then come out full. With a capacity of 3,500 cans an hour and the same amount for bottles though, I was still amazed how Coedo Brewery could cope with the demand. Asagiri-san mentioned about the new brewery that was going to open up soon but was tight-lipped about the details, instead inviting us to come back up again. With that, the tour was over, as was the beer, and we went back to drop off the lab coats, wellies, and those damned hair nets. However, one more surprise was in order when we bumped into Uetake-san whom we met in November 2013 at Antenna America when the Coedonado collaboration was released. Luckily, Uetake-san remembered us and was very open to answering questions in Japanese- and English. The last time we met up and chatted, Uetake-san didn’t speak a word of English but now, he was happy to explain his stance on collaborations and new techniques. According to Uetake-san, the Coedonado (reviewed here) recipe- which uses whiskey barrels- was first touted around other whiskey distilleries in Japan before Ichiro’s Malt. Yet due to the owners, such as Kirin and Suntory, being quite restrictive with what happens to the wooden casks used for whiskey production, Coedo Brewery were unable to get a hold of any for usage. A shame that the major breweries didn’t cooperate with what proved to be a delicious beer. When posed with the prospect of future collaborations, Asagiri-san did hint at some plans for the future; he didn’t say much more than that, however. 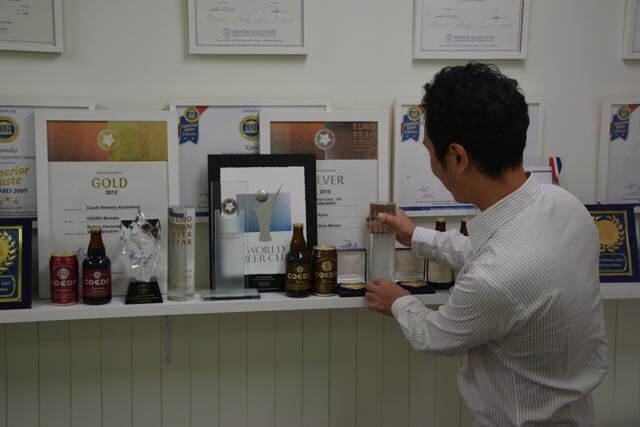 Just some of the awards Coedo has won. Coedo Brewery is one of the oldest craft beer producers and is often seen to be a big player in the market. With the addition of a new brewer, and their first shipment of craft beer on the way to the UK when this article was written, the sweet potato has not seen a brighter future. Along with the saison finally making its bottled debut, are Coedo finally going to shake their reputation of being a safe beer company? Can we visit the brewery? Is there a bar there? There is a brewpub in Saitama where you can see the beers being made, along with Chinese food. The main brewery itself though isn’t open for tours.